Flavonoids are widely distributed in plants, fulfilling many functions. Flavonoids are the most important plant pigments for flower coloration, producing yellow or red/blue pigmentation in petals designed to attract pollinator animals. In higher plants, flavonoids are involved in UV filtration, symbiotic nitrogen fixation and floral pigmentation. They may also act as chemical messengers, physiological regulators, and cell cycle inhibitors. Flavonoids secreted by the root of their host plant help Rhizobia in the infection stage of their symbiotic relationship with legumes like peas, beans, clover, and soy. Rhizobia living in soil are able to sense the flavonoids and this triggers the secretion of Nod factors, which in turn are recognized by the host plant and can lead to root hair deformation and several cellular responses such as ion fluxes and the formation of a root nodule. In addition, some flavonoids have inhibitory activity against organisms that cause plant diseases, e.g. Fusarium oxysporum. Anthocyanidins are the aglycones of anthocyanins; they use the flavylium (2-phenylchromenylium) ion skeleton. Flavonoids (specifically flavanoids such as the catechins) are "the most common group of polyphenolic compounds in the human diet and are found ubiquitously in plants". Flavonols, the original bioflavonoids such as quercetin, are also found ubiquitously, but in lesser quantities. The widespread distribution of flavonoids, their variety and their relatively low toxicity compared to other active plant compounds (for instance alkaloids) mean that many animals, including humans, ingest significant quantities in their diet. Foods with a high flavonoid content include parsley, onions, blueberries and other berries, black tea, green tea and oolong tea, bananas, all citrus fruits, Ginkgo biloba, red wine, sea-buckthorns, buckwheat, and dark chocolate (with a cocoa content of 70% or greater). Further information on dietary sources of flavonoids can be obtained from the US Department of Agriculture flavonoid database. Flavonoid synthesis in plants is induced by light color spectrums at both high and low energy radiations. Low energy radiations are accepted by phytochrome, while high energy radiations are accepted by carotenoids, flavins, cryptochromes in addition to phytochromes. The photomorphogenic process of phytochrome-mediated flavonoid biosynthesis has been observed in Amaranthus, barley, maize, Sorghum and turnip. Red light promotes flavonoid synthesis. Four pieces of magnesium filings are added to the ethanolic extract followed by few drops of concentrated hydrochloric acid. A pink or red colour indicates the presence of flavonoid. Colours varying from orange to red indicated flavones, red to crimson indicated flavonoids, crimson to magenta indicated flavonones. 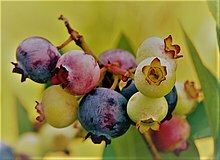 ^ "Flavonoids (isoflavonoids and neoflavonoids)". The Gold Book. 2009. doi:10.1351/goldbook. ISBN 978-0-9678550-9-7. Retrieved 16 September 2012. ^ Galeotti, F; Barile, E; Curir, P; Dolci, M; Lanzotti, V (2008). "Flavonoids from carnation (Dianthus caryophyllus) and their antifungal activity". Phytochemistry Letters. 1: 44–48. doi:10.1016/j.phytol.2007.10.001. ^ Ververidis F, Trantas E, Douglas C, Vollmer G, Kretzschmar G, Panopoulos N (October 2007). "Biotechnology of flavonoids and other phenylpropanoid-derived natural products. Part I: Chemical diversity, impacts on plant biology and human health". Biotechnology Journal. 2 (10): 1214–34. doi:10.1002/biot.200700084. PMID 17935117. ^ Spencer JP (2008). "Flavonoids: modulators of brain function?". British Journal of Nutrition. 99 (E–S1): ES60–77. doi:10.1017/S0007114508965776. PMID 18503736. ^ Oomah, B. Dave; Mazza, Giuseppe (1996). "Flavonoids and Antioxidative Activities in Buckwheat". Journal of Agricultural and Food Chemistry. 44 (7): 1746–1750. doi:10.1021/jf9508357. ^ Ayoub M, de Camargo AC, Shahidi F (2016). "Antioxidants and bioactivities of free, esterified and insoluble-bound phenolics from berry seed meals". Food Chemistry. 197 (Part A): 221–232. doi:10.1016/j.foodchem.2015.10.107. PMID 26616944. ^ The Lancet (2007). "The devil in the dark chocolate". Lancet. 370 (9605): 2070. doi:10.1016/S0140-6736(07)61873-X. PMID 18156011. ^ Serafini M, Bugianesi R, Maiani G, Valtuena S, De Santis S, Crozier A (2003). "Plasma antioxidants from chocolate". Nature. 424 (6952): 1013. Bibcode:2003Natur.424.1013S. doi:10.1038/4241013a. PMID 12944955. ^ Serafini M, Bugianesi R, Maiani G, Valtuena S, De Santis S, Crozier A (2003). "Nutrition: milk and absorption of dietary flavanols". Nature. 424 (6952): 1013. Bibcode:2003Natur.424.1013S. doi:10.1038/4241013a. PMID 12944955. ^ Roura E, et al. (2007). "Milk Does Not Affect the Bioavailability of Cocoa Powder Flavonoid in Healthy Human" (PDF). Ann Nutr Metab. 51 (6): 493–498. doi:10.1159/000111473. PMID 18032884. ^ de Camargo AC, Regitano-d'Arce MA, Gallo CR, Shahidi F (2015). "Gamma-irradiation induced changes in microbiological status, phenolic profile and antioxidant activity of peanut skin". Journal of Functional Foods. 12: 129–143. doi:10.1016/j.jff.2014.10.034. ^ Chukwumah Y, Walker LT, Verghese M (2009). "Peanut skin color: a biomarker for total polyphenolic content and antioxidative capacities of peanut cultivars". Int J Mol Sci. 10 (11): 4941–52. doi:10.3390/ijms10114941. PMC 2808014. PMID 20087468. ^ "Flavonoids - Linus Pauling Institute - Oregon State University". 2014-04-28. Retrieved 26 February 2016. ^ a b c d Vogiatzoglou, A; Mulligan, A. A.; Lentjes, M. A.; Luben, R. N.; Spencer, J. P.; Schroeter, H; Khaw, K. T.; Kuhnle, G. G. (2015). "Flavonoid intake in European adults (18 to 64 years)". PLoS ONE. 10 (5): e0128132. doi:10.1371/journal.pone.0128132. PMC 4444122. PMID 26010916. ^ a b Chun, O. K.; Chung, S. J.; Song, W. O. (2007). "Estimated dietary flavonoid intake and major food sources of U.S. Adults". The Journal of Nutrition. 137 (5): 1244–52. doi:10.1093/jn/137.5.1244. PMID 17449588. ^ a b EFSA Panel on Dietetic Products, Nutrition and Allergies (NDA) (2010). "Scientific Opinion on the substantiation of health claims related to various food(s)/food constituent(s) and protection of cells from premature aging, antioxidant activity, antioxidant content and antioxidant properties, and protection of DNA, proteins and lipids from oxidative damage pursuant to Article 13(1) of Regulation (EC) No 1924/20061". EFSA Journal. 8 (2): 1489. doi:10.2903/j.efsa.2010.1489. ^ a b Yamamoto Y, Gaynor RB (2001). "Therapeutic potential of inhibition of the NF-κB pathway in the treatment of inflammation and cancer". Journal of Clinical Investigation. 107 (2): 135–42. doi:10.1172/JCI11914. PMC 199180. PMID 11160126. ^ a b c Cazarolli LH, Zanatta L, Alberton EH, Figueiredo MS, Folador P, Damazio RG, Pizzolatti MG, Silva FR (2008). "Flavonoids: Prospective Drug Candidates". Mini-Reviews in Medicinal Chemistry. 8 (13): 1429–1440. doi:10.2174/138955708786369564. PMID 18991758. ^ a b Cushnie TP, Lamb AJ (2011). "Recent advances in understanding the antibacterial properties of flavonoids". International Journal of Antimicrobial Agents. 38 (2): 99–107. doi:10.1016/j.ijantimicag.2011.02.014. PMID 21514796. ^ Manner S, Skogman M, Goeres D, Vuorela P, Fallarero A (2013). "Systematic exploration of natural and synthetic flavonoids for the inhibition of Staphylococcus aureus biofilms". International Journal of Molecular Sciences. 14 (10): 19434–19451. doi:10.3390/ijms141019434. PMC 3821565. PMID 24071942. ^ a b Cushnie TP, Lamb AJ (2005). "Antimicrobial activity of flavonoids" (PDF). International Journal of Antimicrobial Agents. 26 (5): 343–356. doi:10.1016/j.ijantimicag.2005.09.002. PMID 16323269. ^ a b Friedman M (2007). "Overview of antibacterial, antitoxin, antiviral, and antifungal activities of tea flavonoids and teas". Molecular Nutrition & Food Research. 51 (1): 116–134. doi:10.1002/mnfr.200600173. PMID 17195249. ^ de Sousa RR, Queiroz KC, Souza AC, Gurgueira SA, Augusto AC, Miranda MA, Peppelenbosch MP, Ferreira CV, Aoyama H (2007). "Phosphoprotein levels, MAPK activities and NFkappaB expression are affected by fisetin". J Enzyme Inhib Med Chem. 22 (4): 439–444. doi:10.1080/14756360601162063. PMID 17847710. ^ Schuier M, Sies H, Illek B, Fischer H (2005). "Cocoa-related flavonoids inhibit CFTR-mediated chloride transport across T84 human colon epithelia". J. Nutr. 135 (10): 2320–5. doi:10.1093/jn/135.10.2320. PMID 16177189. ^ Esselen M, Fritz J, Hutter M, Marko D (2009). "Delphinidin Modulates the DNA-Damaging Properties of Topoisomerase II Poisons". Chemical Research in Toxicology. 22 (3): 554–64. doi:10.1021/tx800293v. PMID 19182879. ^ Bandele OJ, Clawson SJ, Osheroff N (2008). "Dietary polyphenols as topoisomerase II poisons: B-ring substituents determine the mechanism of enzyme-mediated DNA cleavage enhancement". Chemical Research in Toxicology. 21 (6): 1253–1260. doi:10.1021/tx8000785. PMC 2737509. PMID 18461976. ^ Barjesteh van Waalwijk van Doorn-Khosrovani S, Janssen J, Maas LM, Godschalk RW, Nijhuis JG, van Schooten FJ (2007). "Dietary flavonoids induce MLL translocations in primary human CD34+ cells". Carcinogenesis. 28 (8): 1703–9. doi:10.1093/carcin/bgm102. PMID 17468513. ^ Williams RJ, Spencer JP, Rice-Evans C (2004). "Flavonoids: antioxidants or signalling molecules?". Free Radical Biology & Medicine. 36 (7): 838–49. doi:10.1016/j.freeradbiomed.2004.01.001. PMID 15019969. ^ Ravishankar D, Rajora AK, Greco F, Osborn HM (2013). "Flavonoids as prospective compounds for anti-cancer therapy". The International Journal of Biochemistry & Cell Biology. 45 (12): 2821–2831. doi:10.1016/j.biocel.2013.10.004. PMID 24128857. ^ Manach C, Mazur A, Scalbert A (2005). "Polyphenols and prevention of cardiovascular diseases". Current Opinion in Lipidology. 16 (1): 77–84. doi:10.1097/00041433-200502000-00013. PMID 15650567. ^ Babu PV, Liu D, Gilbert ER (2013). "Recent advances in understanding the anti-diabetic actions of dietary flavonoids". The Journal of Nutritional Biochemistry. 24 (11): 1777–1789. doi:10.1016/j.jnutbio.2013.06.003. PMC 3821977. PMID 24029069. ^ Ferretti G, Bacchetti T, Masciangelo S, Saturni L (2012). "Celiac Disease, Inflammation and Oxidative Damage: A Nutrigenetic Approach". Nutrients. 4 (12): 243–257. doi:10.3390/nu4040243. PMC 3347005. PMID 22606367. ^ a b c Izzi V, Masuelli L, Tresoldi I, Sacchetti P, Modesti A, Galvano F, Bei R (2012). "The effects of dietary flavonoids on the regulation of redox inflammatory networks". Frontiers in Bioscience. 17 (7): 2396–2418. doi:10.2741/4061. PMID 22652788. ^ Gomes A, Couto D, Alves A, Dias I, Freitas M, Porto G, Duarte JA, Fernandes E (2012). "Trihydroxyflavones with antioxidant and anti-inflammatory efficacy". BioFactors. 38 (5): 378–386. doi:10.1002/biof.1033. PMID 22806885. ^ Chang CF, Cho S, Wang J (Apr 2014). "(-)-Epicatechin protects hemorrhagic brain via synergistic Nrf2 pathways". Ann Clin Transl Neurol. 1 (4): 258–271. doi:10.1002/acn3.54. PMC 3984761. PMID 24741667. ^ Martinez-Micaelo N, González-Abuín N, Ardèvol A, Pinent M, Blay MT (2012). "Procyanidins and inflammation: Molecular targets and health implications". BioFactors. 38 (4): 257–265. doi:10.1002/biof.1019. PMID 22505223. ^ Romagnolo DF, Selmin OI (2012). "Flavonoids and cancer prevention: a review of the evidence". J Nutr Gerontol Geriatr. 31 (3): 206–38. doi:10.1080/21551197.2012.702534. PMID 22888839. ^ Woo HD, Kim J (2013). "Dietary flavonoid intake and smoking-related cancer risk: a meta-analysis". PLoS ONE. 8 (9): e75604. Bibcode:2013PLoSO...875604W. doi:10.1371/journal.pone.0075604. PMC 3777962. PMID 24069431. ^ van Dam RM, Naidoo N, Landberg R (2013). "Dietary flavonoids and the development of type 2 diabetes and cardiovascular diseases". Current Opinion in Lipidology. 24 (1): 25–33. doi:10.1097/MOL.0b013e32835bcdff. PMID 23254472. ^ Tangney CC, Rasmussen HE (2013). "Polyphenols, Inflammation, and Cardiovascular Disease". Current Atherosclerosis Reports. 15 (5): 324. doi:10.1007/s11883-013-0324-x. PMC 3651847. PMID 23512608. ^ Siasos G, Tousoulis D, Tsigkou V, Kokkou E, Oikonomou E, Vavuranakis M, Basdra EK, Papavassiliou AG, Stefanadis C (2013). "Flavonoids in atherosclerosis: An overview of their mechanisms of action". Current Medicinal Chemistry. 20 (21): 2641–2660. doi:10.2174/0929867311320210003. PMID 23627935. ^ Cappello, AR, Dolce V, Iacopetta D, Martello M, Fiorillo M, Curcio R, Muto L, Dhanyalayam D. (2015). "Bergamot (Citrus bergamia Risso) Flavonoids and Their Potential Benefits in Human Hyperlipidemia and Atherosclerosis: an Overview". Mini-Reviews in Medicinal Chemistry. 16 (8): 1–11. doi:10.2174/1389557515666150709110222. PMID 26156545. ^ Search Results. "Flavonoids in cardiovascular disease clinical trials". Clinicaltrials.gov. US National Institutes of Health. Retrieved November 24, 2013. ^ Wang X; Ouyang YY; Liu J; Zhao G (January 2014). "Flavonoid intake and risk of CVD: a systematic review and meta-analysis of prospective cohort studies". The British Journal of Nutrition. 111 (1): 1–11. doi:10.1017/S000711451300278X. PMID 23953879. ^ Taylor PW, Hamilton-Miller JM, Stapleton PD (2005). "Antimicrobial properties of green tea catechins". Food Science and Technology Bulletin. 2 (7): 71–81. doi:10.1616/1476-2137.14184. PMC 2763290. PMID 19844590. ^ Choi O, Yahiro K, Morinaga N, Miyazaki M, Noda M (2007). "Inhibitory effects of various plant polyphenols on the toxicity of Staphylococcal alpha-toxin". Microbial Pathogenesis. 42 (5–6): 215–224. doi:10.1016/j.micpath.2007.01.007. PMID 17391908. ^ Oh DR, Kim JR, Kim YR (2010). "Genistein inhibits Vibrio vulnificus adhesion and cytotoxicity to HeLa cells". Archives of Pharmacal Research. 33 (5): 787–792. doi:10.1007/s12272-010-0520-y. PMID 20512479. ^ a b González-Segovia R, Quintanar JL, Salinas E, Ceballos-Salazar R, Aviles-Jiménez F, Torres-López J (2008). "Effect of the flavonoid quercetin on inflammation and lipid peroxidation induced by Helicobacter pylori in gastric mucosa of guinea pig". Journal of Gastroenterology. 43 (6): 441–447. doi:10.1007/s00535-008-2184-7. PMID 18600388. ^ Zamora-Ros R, Agudo A, Luján-Barroso L, Romieu I, Ferrari P, Knaze V, Bueno-de-Mesquita HB, Leenders M, Travis RC, Navarro C, Sánchez-Cantalejo E, Slimani N, Scalbert A, Fedirko V, Hjartåker A, Engeset D, Skeie G, Boeing H, Förster J, Li K, Teucher B, Agnoli C, Tumino R, Mattiello A, Saieva C, Johansson I, Stenling R, Redondo ML, Wallström P, Ericson U, Khaw KT, Mulligan AA, Trichopoulou A, Dilis V, Katsoulis M, Peeters PH, Igali L, Tjønneland A, Halkjær J, Touillaud M, Perquier F, Fagherazzi G, Amiano P, Ardanaz E, Bredsdorff L, Overvad K, Ricceri F, Riboli E, González CA (2012). "Dietary flavonoid and lignan intake and gastric adenocarcinoma risk in the European Prospective Investigation into Cancer and Nutrition (EPIC) study". American Journal of Clinical Nutrition. 96 (6): 1398–1408. doi:10.3945/ajcn.112.037358. PMID 23076618. ^ Sinha, Rajiv Kumar (2004-01-01). Modern Plant Physiology. CRC Press. p. 457. ISBN 9780849317149. ^ Hwang EI, Kaneko M, Ohnishi Y, Horinouchi S (May 2003). "Production of plant-specific flavanones by Escherichia coli containing an artificial gene cluster". Appl. Environ. Microbiol. 69 (5): 2699–706. doi:10.1128/AEM.69.5.2699-2706.2003. PMC 154558. PMID 12732539. ^ Trantas E, Panopoulos N, Ververidis F (2009). "Metabolic engineering of the complete pathway leading to heterologous biosynthesis of various flavonoids and stilbenoids in Saccharomyces cerevisiae". Metabolic Engineering. 11 (6): 355–366. doi:10.1016/j.ymben.2009.07.004. PMID 19631278. ^ Ververidis F, Trantas E, Douglas C, Vollmer G, Kretzschmar G, Panopoulos N (2007). "Biotechnology of flavonoids and other phenylpropanoid-derived natural products. Part II: Reconstruction of multienzyme pathways in plants and microbes". Biotechnology Journal. 2 (10): 1235–49. doi:10.1002/biot.200700184. PMID 17935118. ^ Yisa, Jonathan (2009). "Phytochemical Analysis and Antimicrobial Activity Of Scoparia Dulcis and Nymphaea Lotus". Australian Journal of Basic and Applied Sciences. 3 (4): 3975–3979. ^ Bello IA, Ndukwe GI, Audu OT, Habila JD (2011). "A bioactive flavonoid from Pavetta crassipes K. Schum". Organic and Medicinal Chemistry Letters. 1 (1): 14. doi:10.1186/2191-2858-1-14. PMC 3305906. PMID 22373191. ^ Lamaison, JL; Carnet, A (1991). "Teneurs en principaux flavonoides des fleurs de Cratageus monogyna Jacq et de Cratageus Laevigata (Poiret D.C) en Fonction de la vegetation". Plantes Medicinales Phytotherapie. 25: 12–16. ^ Passicos E, Santarelli X, Coulon D (2004). "Regioselective acylation of flavonoids catalyzed by immobilized Candida antarctica lipase under reduced pressure". Biotechnol. Lett. 26 (13): 1073–1076. doi:10.1023/B:BILE.0000032967.23282.15. PMID 15218382. Wikimedia Commons has media related to Flavonoids.